Before he became “The Man,” he was simply a sailor. A 24-year-old sailor with a National League Most Valuable Player award and two World Series wins. 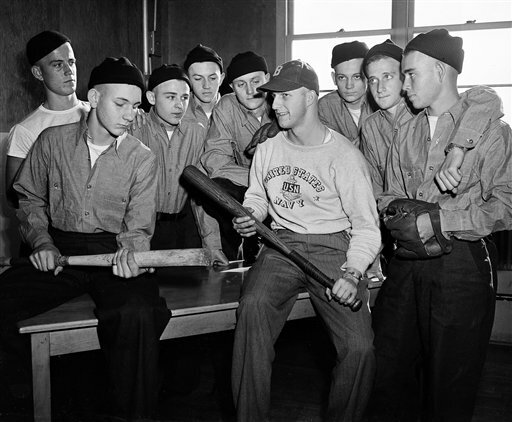 A sailor who, months before joining the Navy, led the NL with 197 hits, 51 doubles and a .541 slugging percentage — a stat that didn’t even exist yet — before leading his St. Louis Cardinals over the crosstown rival Browns in the Fall Classic. But still, a sailor. Stan Musial, who died Saturday at age 92, entered service at the tail end of World War II, joining a list of veteran baseball players that would stack up well against an all-star team from any era: Williams, DiMaggio, Berra, Spahn, Snider, Feller, Kiner … and so on. He was drafted in May 1944 and called to duty in January 1945, beginning a 15-month Navy career that included a stop with a ship repair unit in Pearl Harbor, according to the Navy Memorial’s online records (Musial would receive that organization’s Lone Sailor Award, which honors Navy veterans who’ve excelled in civilian life, in 2007). He was released from service as a seaman first class in March 1946. If he lost a step on the diamond, it didn’t show — he finished the 1946 season with an NL-best .365 batting average, led the league in hits, runs, doubles and triples (and slugging percentage, which wouldn’t even debut in a primitive form until the next decade), earned another MVP award and won another World Series. He played until 1963, finishing with a .331 career average and 475 home runs. He was inducted into the Baseball Hall of Fame in 1969. Read more about Musial’s military life here. He’s featured in a book about wartime baseball by Frederick Turner; read the first chapter here.